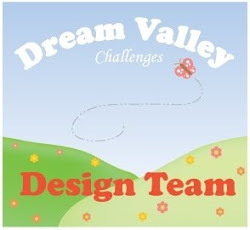 Come over and join us at the Dream Valley Challenge. The challenge is All things bright and beautiful. My card this time is of birds as they are often bright and I kind of remembered the childhood song about all creatures great and small. I stamped these birds with black Stazon ink, masking the outside birds so the the centre bird looks as if he is behind them. I used the stazon ink so that I could watercolour with some of my pens for this card. I have a white ceramic tile I use to scribble colour onto and then watercolour from there. The birds look so quirky and I’ve recently got this set so this challenge gave me a good excuse to use them! The background I’d already got from an inking and spritzing session I had a while ago, but the colours matched so beautifully that I made a card blank to fit the topper. I love it when things all come together. Fabulous colours, Debbie! I adore those quirky birds! I love those Tim Holtz so much and you’ve colored them beautifully. Your background is gorgeous. Darling card!